No, this isn’t my life. It’s my husband’s favorite movie, The Family Man. But every time we watch that flick, he wants a funnel cake. No. He “needs” a funnel cake. 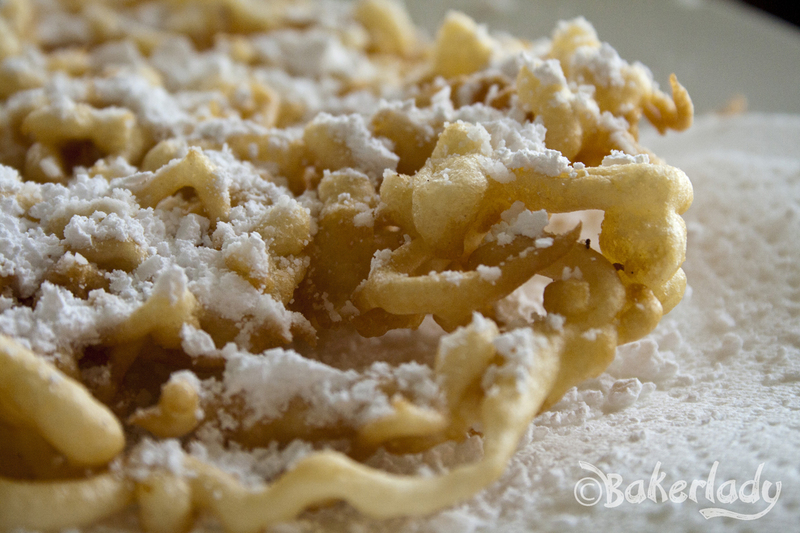 Is loving funnel cakes just part of being a dude? My husband has raved about them for the past 15 years, finally convincing me to share one with him last summer. I’ll admit, they are delicious. 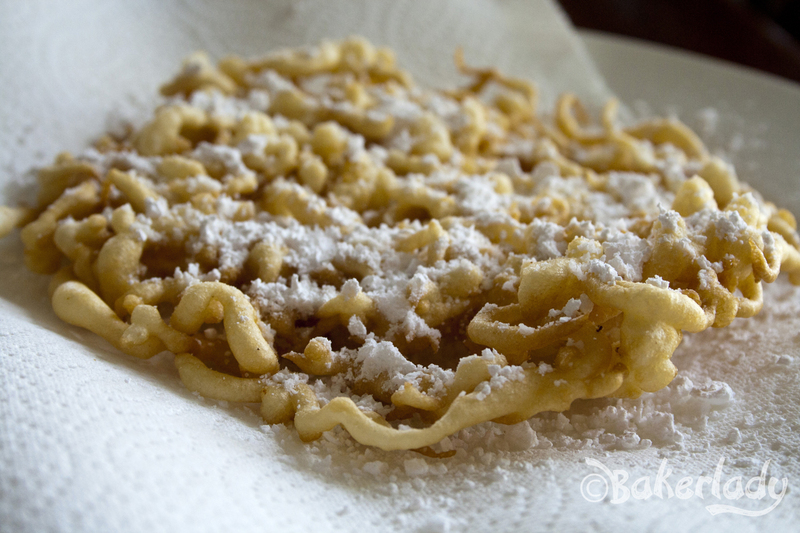 A classic carnival food, you can easily make them at home with a few simple ingredients. Pour the batter by filling a funnel (holding a finger over the bottom) and then letting the batter flow out into your oil as you spiral the funnel around. Or, you can fill a ziplock bag with a snipped end or use a cleaned out ketchup bottle as a batter dispenser. I wanted this as classic as possible – so I busted out my funnel. I got my finger all batter-y in the process, but it was worth it. 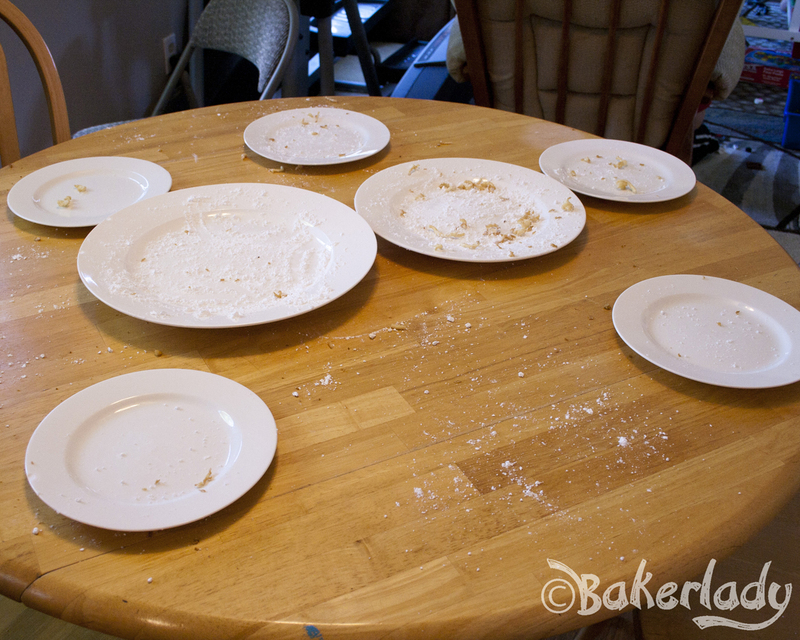 Funnel cakes create a HUGE mess. Just prepare yourself for that. 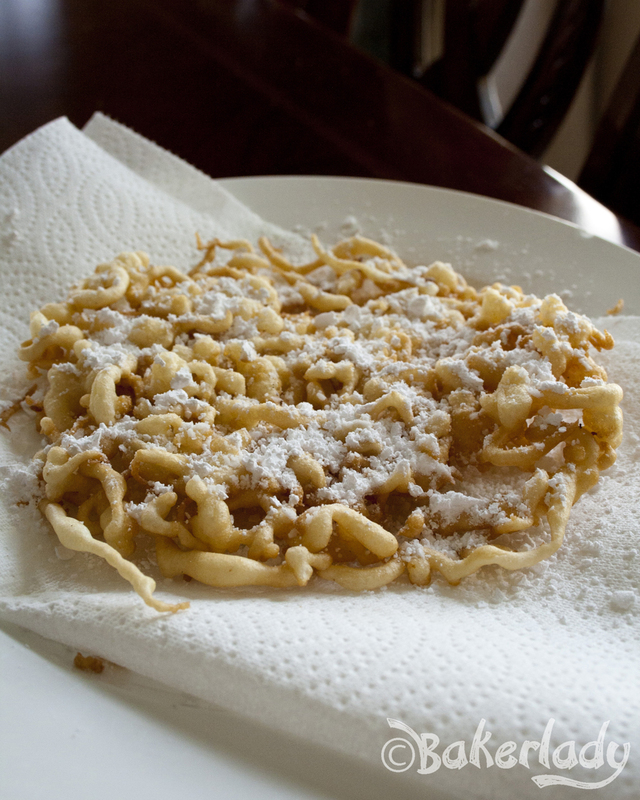 Making them is pretty sloppy because of the frying oil and swirling batter, and the aftermath of eating devouring inhaling pillowy swirls of dough imitates a powdered sugar tornado hitting your kitchen. Worth. It. The kids who left this disaster in their wake were shoveling pieces into their mouths with both hands, barely taking time to take a breath before filling their hands with more deliciousness. 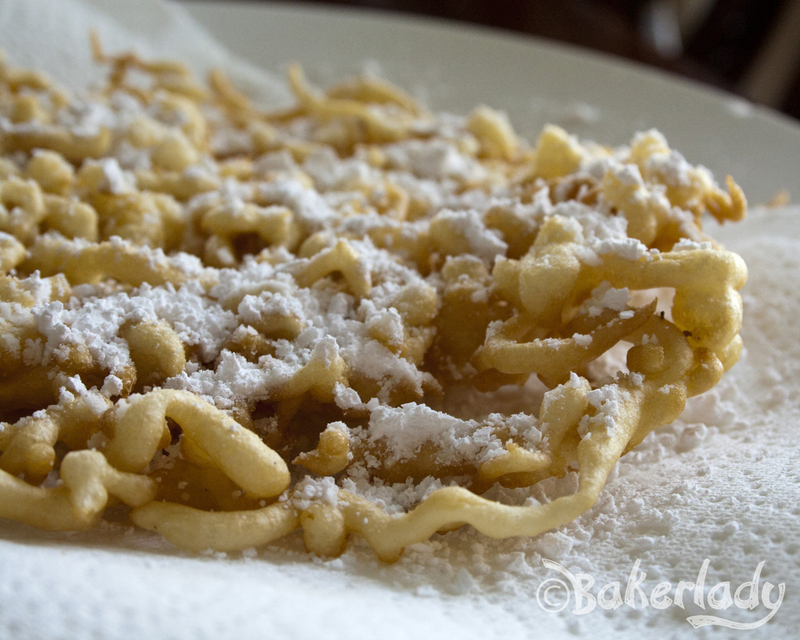 None of them had ever tasted a funnel cake before, and I couldn’t swirl batter fast enough to keep up with their appetites for light crisp dough. I see why there’s always a giant line for funnel cakes at our local fair. I put a little allspice in my batter, but you can change that for nutmeg or cinnamon per your own preference. It just gives the batter a hint of flavor beyond sweet doughy goodness. Top with powdered sugar. As much as you like. Mine got just a dusting. Mmmmm, delicious! One last thing. I didn’t come anywhere close to adding the full amount of flour. Start with 2 cups and then add until you have the right drizzly consistency. The exact amount will depend on what % fat milk you use, the humidity, altitude, if you are wearing socks and the day of the week. 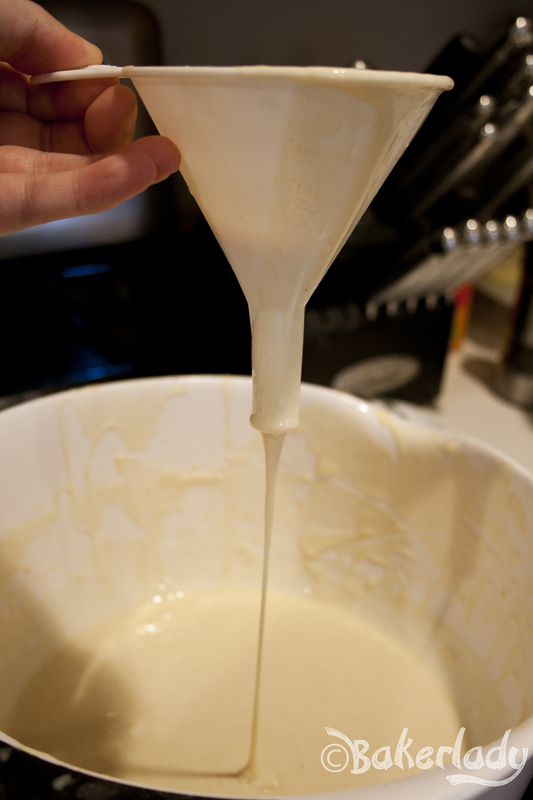 If you should happen to add just a touch too much, simply thin out your batter with a little milk. No problemo. 1. Mix salt, baking powder, allspice, and half the flour in a bowl. Set aside. 2. Cream eggs, sugar, vanilla and milk in a large bowl. Add flour mixture and beat until smooth. Continue to add remaining flour, but use only enough to achieve desired consistency. Batter should be thin enough to run through a funnel. 3. Heat the oil to 375 degrees F (190 degrees C) in an 8-inch skillet. Or heat oil in your deep fryer (I use a FryDaddy). 4. Put your finger over the bottom opening of the funnel, and fill the funnel with a generous 1/2 cup of the batter. Hold the funnel close to the surface of the oil, and release the batter into the oil while making a circular motion. Fry until golden brown. Use tongs and wide spatula to turn the cake over carefully. Fry the second side one minute. 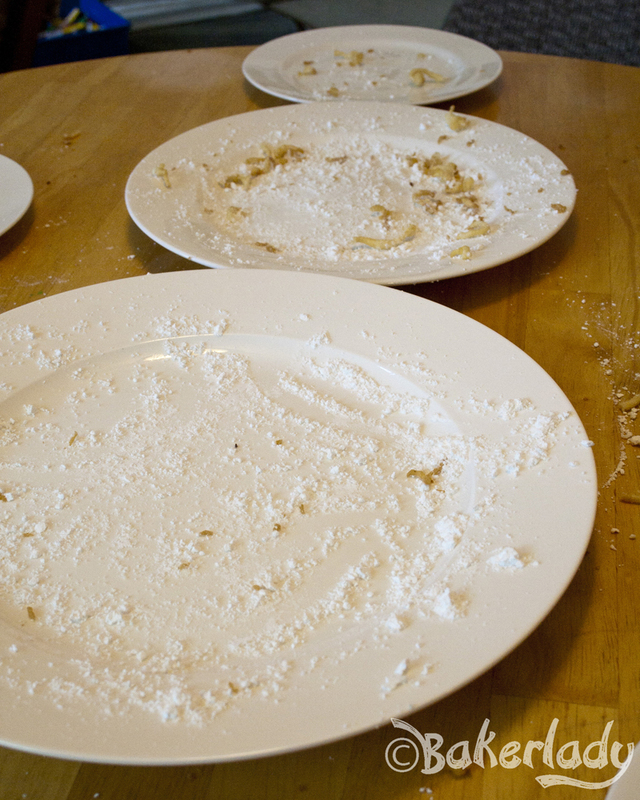 Drain on paper towels, and sprinkle with sifted confectioners’ sugar.